Hoo hoo ho-ho, hoo hoo ho-hooooooaawr! Welcome to my home, the large mature woods by the water! No, I am not one of those nasty great horned owls. I’m a barred owl (Strix varia). I say nasty, because the horned owls eat on our eggs, our young, and sometimes even us adults. Let me explain how we differ from a great horned. We possess brown eyes and a yellow bill, not yellow eyes and a black bill. No feather tufts sprout up from our round heads. Mottled brown and white feathers cover our backs. 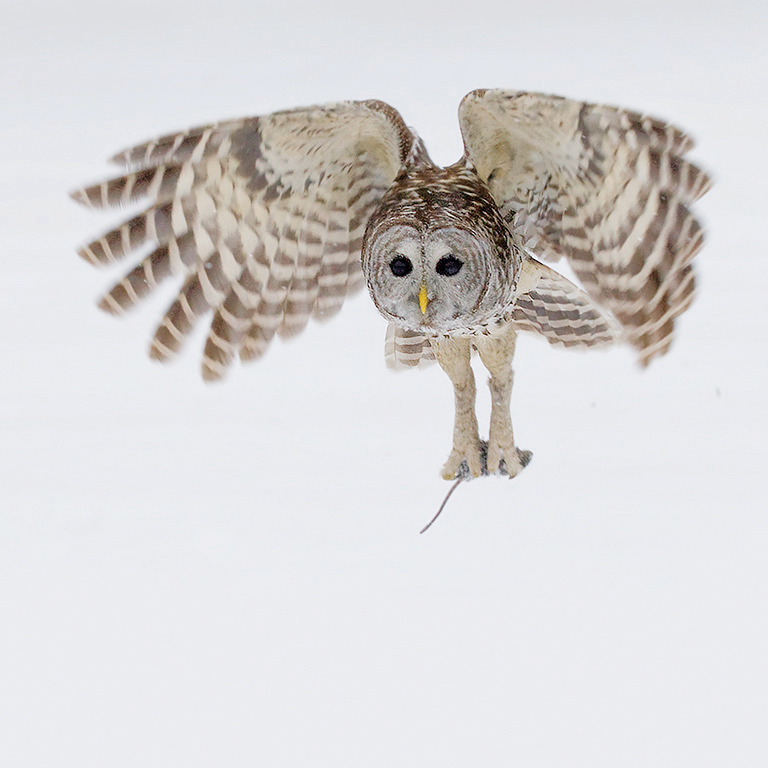 On a cream-colored background, we sport brown horizontal chest bars and vertical belly bars, thus our name, barred owl. When fully grown, we measure about 18 inches tall with a three-to-four-foot wing span. We only weigh one to two pounds with the females growing larger. As early spring approaches, listen for our raucous courtship duet of cackles, hoots, caws and gurgles. Or, spy our courtship dance of bobbing and bowing, half-spreading wings, with our head wobbling and twisting from side to side. It’s quite the sight. As the male, I may feed my mate tasty morsels. We perform our courtship ritual every year despite mating for life. After courting, we look for the perfect nest site. We like a large cavity in a dead tree or a broken off snag. An abandoned stick nest, like one built by a red-shouldered hawk, crow or squirrel also works well. We usually move right in, but sometimes we touch it up with lichen, fresh evergreen sprigs, or feathers. Over a few days, my mate lays two, three and sometimes even four rough white eggs. While she incubates them for four weeks, I hunt and bring back food for her. Once the closed-eyed, down-covered owlets hatch, I continue to feed her and the owlets until they can be left alone. Then both of us hunt to feed ourselves and our growing young until they fledge at about six weeks old. I’m so glad we raise only one brood a year! We generally hunt from dusk until dawn, but sometimes we must hunt during the day when we have hungry owlets to feed. Usually, we sit very still on a perch using our incredible hearing and eyesight to locate prey. Sometimes we will fly low through the forest searching for food. Once found, we swoop down and grab it with our sharp talons. We swallow small pray whole, right away. With bigger animals, we take it to a spot where we tear it into big chunks to eat. Occasionally, we temporarily store prey in a nest, the crook of a tree, or the top of snag. Our favorite prey includes small mammals like voles, mice, shrews, chipmunks, and squirrels, but we also eat rabbits, opossums, birds, frogs, snakes, and invertebrates. You may spy us wading or swooping into the water for a fish or crayfish. Next time you find yourself in a forest near water, listen. You may hear us ask, “Who cooks for you? Who cooks for you alllll?” Hoo hoo ho-ho, hoo hoo ho-hooooooaawr!